I received a copy of this book from the author in exchange for my honest review. This post contains links to Amazon. If you click on the link and make a purchase, I get a tiny commission of the sale. 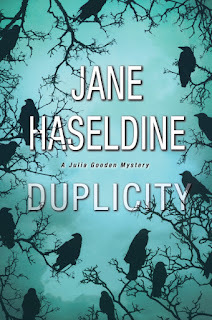 I love a good mystery and thriller and Duplicity had all the makings of a classic thriller, so I was excited to pick it up. But on top of that, the cover is simply gorgeous and so enticing! One of the things that drew me to the story as well is that author Jane Haseldine is a former crime writer herself so I knew that she might pepper in bits of her own experience to the story that would give it an added touch of authenticity. Duplicity is the second in a series, but I did not read the first one. It didn't really matter. While events in the first book were alluded to, I was able to fully understand the current situation and characters. Julia Gooden is a crime reporter married to an Assistant DA which, as you can imagine, creates a situation screaming conflict of interest! Especially when the prosecutor secures a top secret witness in an ongoing case, but a crime writer would want to know exactly who that is! Adding to the boiling pot of emotions is the fact that Julia and her husband are only patching things together in their marriage and still keeping their reunited status from their children. Something happens though and the city faces a great attack. Suddenly David's life is hanging in the balance and the crime boss he was threatening to put away is looking to go free. Julia can't let this rest and takes it upon herself to investigate what happened and make sure the right people are punished. 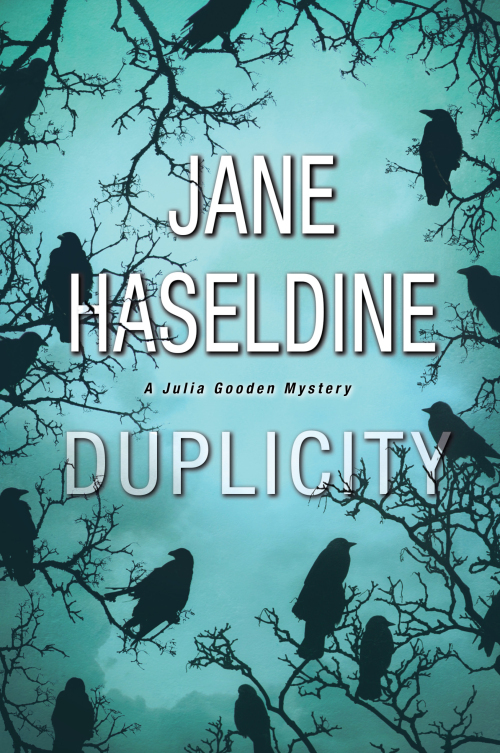 Duplicity is a fast thriller. The pace is fairly unrelenting and while the characters definitely experience a range of emotions the story doesn't take a lot of time to sit in them. I really enjoyed the read, I found it quick and pleasurable with a lot of twists and turns. I was definitely surprised by the conclusion--it wasn't something I necessarily saw coming. I also really enjoyed the character of Julia and her relentless pursuit of the truth. Sometimes I feel like it would have been fun to be an investigative reporter, but it also seems like a profession that sort of owns you. You don't get to choose the timetable at all! Even so, Julia's tenacity and courage were admirable, if at times frustrating, and made for a good story. The story doesn't hold back and goes full force ahead into where it needs to go. Recommended! You can visit the author's web page and buy the book on Amazon.